New Zealand isn’t renowned for a particular type of cuisine. Eating out is expensive compared to every else in the world (with the exception of Australia). There are we Kiwis do really well. We’re great at not destroying our food. You won’t find over-processed, over-fried food here. The focus of most meals is fresh, honest ingredients prepared with care and a little Kiwi flair. With our abundance of coastline and farm land, seafood and meat are what we do best. Some of the foods we love are our own creations and some we’ve borrowed from our cultural influences. When you come to New Zealand, what would I suggest you eat and drink? If you were my guest here’s what we’d have! 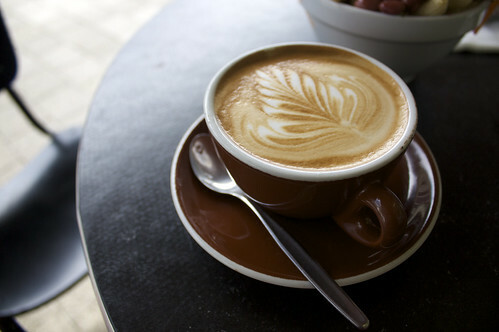 New Zealand’s signature coffee, the flat white is a single or double shot of espresso topped with flat, foamy milk from the bottom of the steaming jug. Think latte, only smaller with a higher proportion of coffee than milk. Coffee afficiandos will have a great time in New Zealand’s small, independent cafes. Kiwis love to support the little guy (being that we’re little ourselves) and funky, offbeat cafes are much more popular the Starbucks. What is a hokey pokey? Crunchy, butterscotch-like deliciousness, that’s what. Every Kiwi kid loves Hokey Pokey ice cream – hokey pokey balls generously dotted through a mildly butterscotch flavoured ice cream . You can get a scoop from a dairy (a corner store) for as little as $2. Whether you have them wrapped in paper while sitting on the beach or off a plate in a pub or cafe, Kiwis do a mean “fush & chups”. 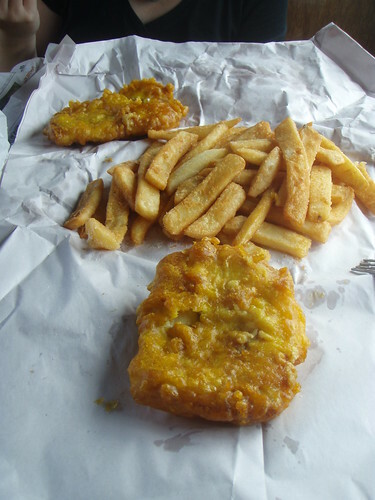 New Zealand’s favourite fast food, even the smallest town will have a fish and chip shop. Generally the fish served is shark, which tastes pretty good, but most outlets now serve a choice of fishes – Hoki, Gurnard and Blue Cod are all good choices. If you’re gluten-free, don’t fret. Many shops now advertise a gluten-free option when battering or crumbing your fillet. Wash down your fush and chups with New Zealand’s own fizzy drink. 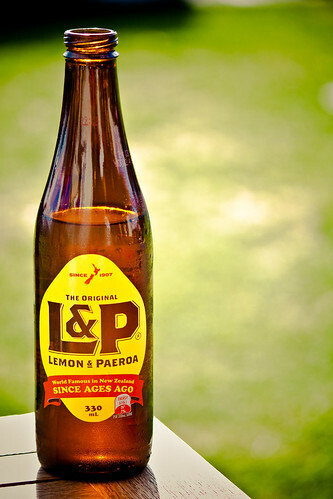 L&P, short for Lemon and Paeroa, is an unexplicably tasty beverage that’s been brewed in New Zealand since, well, ages ago! The drink itself is impossibleto describe, it’s lemony and Paeroa-y. Paeroa isn’t a flavour, it’s the town in which L&P is made.The mineral water in Paeroa has a high magensium bicarbonate content which gives the drink it’s unique taste. Lemon and magenesium bicarbonate doesn’t quite have the same ring to it! If you love seafood, the first meal you have when you get off the plane should be a big bowl of New Zealand green-lipped mussels. They’re bigger, fatter and juicer than other varieties found worldwide. Mildy fishy and very delicious you’ll see them on almost every cafe or pub menu. Best served in a bowl with a creamy white wine sauce and crusty bread to soak up the juices. Probably more famous worldwide than in New Zealand itself, Fergburger and it’s tasty gourmet hamburgers have grown to legendary status amongst the backpacker and snowboarder set. 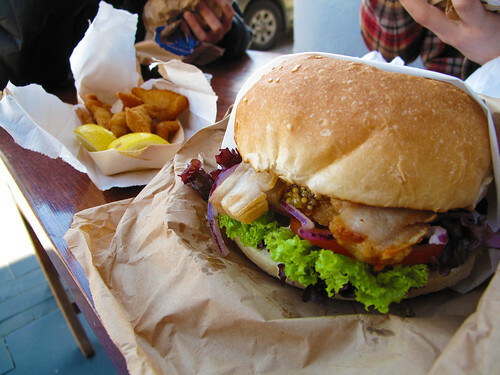 Located in Queenstown, Fergburger serves humongous burgers with out-of-the-box fillings like slow roasted pork belly (pictured above), wild deer, ribeye steak and blue cod. Vegetarians are catered for with either a satay tofu or falafel burger. The only catch? You’ll wait about 45 minutes for your order and most likely have to eat standing up on the street. They’re that good! This thick, black yeast paste is a staple for Kiwi kids, though you’d be forgiven for not trying it! 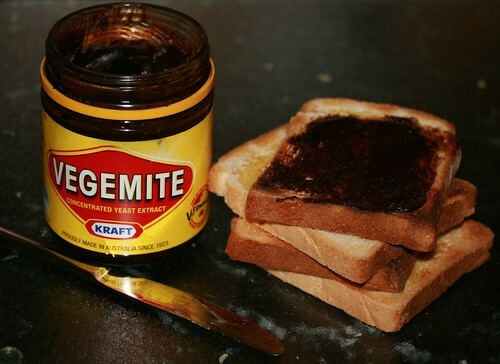 It is an acquired taste but the main problem tourists have with vegemite and marmite is spreading it on their toast too thickly. Go in with a heavy hand as if spreading peanut butter or nutella and you’re in for a nasty surprise. Less is more when it comes to Vegemite or Marmite. It goes best on hot toast with lots of butter. 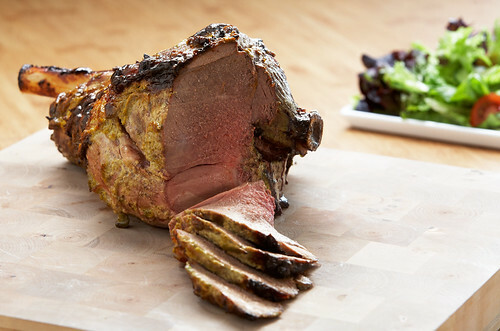 New Zealand lamb is the best of the world and is exported around the globe. Still, the best place to try it is here in New Zealand. It’s not cheap here and will most likely be the most expensive item on the restaurant menu. In summer go for barbequed lamb rack or chops with mint sauce. In winter eat it roasted with root veges or in a tasty stew. 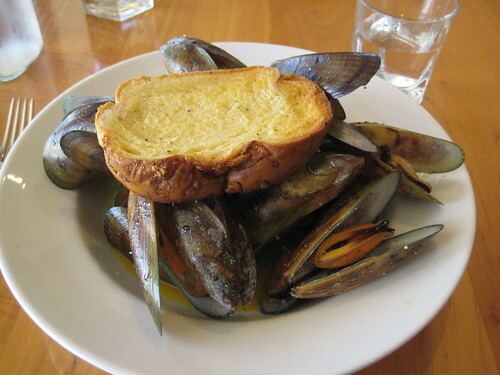 A hāngi is a traditional Maori method of cooking. 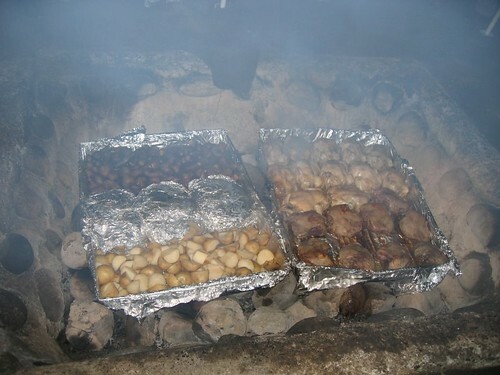 Hot stones from the fire are placed in a pit, on goes the food covered in tin foil and is then buried for several hours. Meat and root vegetables are slow cooked in the hāngi producing a tender, flavourful meal. You won’t find it on any restaurant menu though. Look for hāngi as part of cultural park experiences or put the word out in the towns you visit as hāngi’s are often used as a community fundraising method. 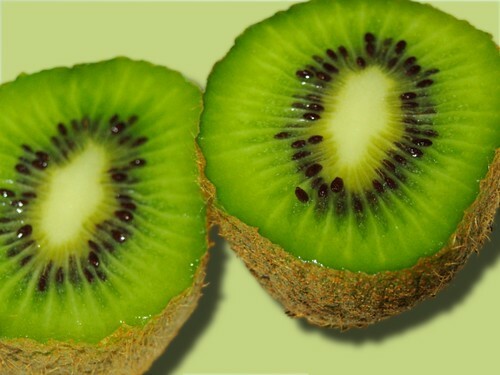 New Zealand’s national fruit, the Kiwifruit or Kiwi (if you’re a foreigner) grows in abundance in the North Island of the country. Cut in half, scoop out the tangy, acidic flesh with a spoon and eat, pips and all. Only the brave will eat the furry brown skin. All photos sourced under creative commons. I love Whittakers chocolate! It almost made the list. It is far superior to the Cadbury’s chocolate, in my opinion. Perfect timing! My girls and I were just wondering what foods we should try while we’re here. We tried the Hokey Pokey ice cream today and you described it perfectly. Can’t wait to try the rest! Excellent Paige. Here are some other treats you might like to try – Crunchie bars, Jaffas, Magnum ice creams, banana milkshakes… all from the dairy (local corner store). Awesome list, Bethaney! Although, for ‘truly kiwi’ I would have suggested Marmite over Vegemite, despite the current Marma-ggedon happening at the moment. Ahh, the Vegemite vs Marmite debate!! I thought about that when I wrote it post but I MUCH prefer the taste of Vegemite to Marmite and it’s more world-renowned than Marmite so I thought I’d go with that! I love the list however, how did Vegemite get in this list? I have some Australian friends who said Vegemite is a very Australian thing whereas Marmite is produced in New Zealand. So what’s up with that? Simple Annie… Vegemite tastes better! A lot of Kiwis prefer it. You got that right. vegemite is the only way. LOL, i love your answer. I’ll have to pass this tidbit of info to my Good Aussie Friend who actually said the same thing..
Yum, Yum and yum. when I get to NZ next month I’m going to gorge on all of these. 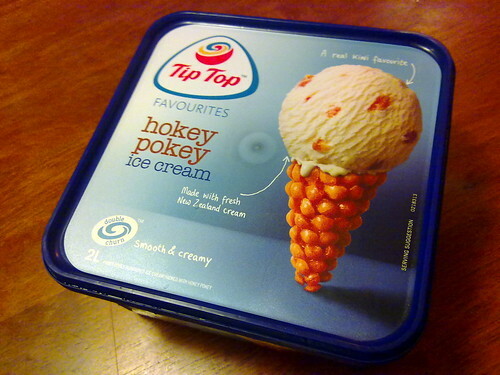 Really want to try Hokey pokey – many a New Zealander has raved about it. Hokey Pokey ice cream is delicious. My absolute favourite ice cream flavour and one of the things I really miss when I’m not in New Zealand. As mentioned above, keep an eye out for Whittakers Hokey Pokey chocolate too! Love this! Where are the whitebait patties though!? Hehe. Oh and chocolate fish? Did you know you can’t get Sunmaid raisins in Aussie? Think it’s something to do with the fact that Australia has it’s own raisin/sultana sources and doesn’t want to import them from California but they are the BEST and I grew up on those little red boxes…. I make my Mum post them to me 😉 Misty LOVES them! Ahhh… I can’t believe I missed whitebait patties off the list!!! I might have to turn it into 20 Must Try Kiwi Foods!!!! We ticked off 9 of these items while we were in NZ – the only one we missed was the flat white because we don’t drink coffee. But we did enjoy some beautiful hot chocolates in Wellington! We do great hot chocolates too eh? I’m impressed you made it through all these items Kieron! JAFFAS?! Arent they australian. I had Hoopers the other day in USA – a reall ybad version of maltesers, such a shame. Aust does chocolate better than anywhere else I have been. I’m pretty sure the Jaffas are made here Erin!!! I love Maltesers too. The US alternatives are horrible!!! I’ve tried the Kiwi Marmite, when I first moved to Australia, I was hoping it was British Marmite in weird packaging. It’s not. Shall we just say that after the first taste I didn’t try it again. I can’t eat Vegemite, either. I buy British Marmite, it’s sold here as Our Mate or Britmite because the Kiwis have the copyright on the Marmite name. I like it with avocado on toast. I am seriously considering driving to Queenstown for one!!!! Vegemite? Stealing a little bit of Australia there. 😛 I carry Vegemite all over the world with me, love it! You seem to have forgotten the pavlova… But Australia claims that as well so that’s good. The list is similar to what I would say for Aus. We love fish and chips (not fush and chups haha) on the beach too, our favourite although we usually eat Snapper. You mean, you love feesh and cheeps!!!! Otherwise a great list and brings back many memories of growing up in New Zealand, thanks. Great list! The ice cream looks a fun treat. And the fish and chips w/ shark?… When I read that, it totally pulled a rip cord on my mind. I wonder if it’s expensive. Sharks don’t lay easily into a net, I imagine. A friend of mine who has just moved here from India is ADDICTED to Cookie Time cookies as well! Good list, and agree with the other comments, you need to expand the list to 20! Add Paua fritters, whitebait fritters, feijoas, watties tomato sauce, whittakers chocolate, banana smoothies, mince pies, black knight licorise, tim tams, pineapple lumps! As for me the Pavlova is totally missing. The rest is perfectly done!